Dog water toys are a great way to not only give your dog the exercise he needs but also to have fun and form a great bond in the process. There are plenty of water toys on the market today that will work for all breeds, sizes and ages. Whether you've got an active Aussie who loves to move or a little Dachshund who can't seem to stay out of the water, you can have lots of fun and help your dog to stay cool and hydrated too. All dogs need regular exercise to keep their joints healthy and their weight regulated. It can be difficult to keep up their normal level of activity when the weather gets hot, though, because it is easy for them to be affected by heat stroke. By using water toys such as pools, balls and retrievable toys, you can encourage your dog to get the exercise he needs and keep cool at the same time. Since most dogs love water, it's an easy connection to make. One of the best ways to enjoy the water with your pet is by using specially designed water toys, such as those made by Chuckit! This company designs dog water toys made of rubber and memory foam so that they float on the surface of the water. The brightly colored nylon covers on the toys make them easily visible so that your dog can find and retrieve them quickly, providing hours of fun. The dog water toy featured in the photo above is the Chuckit! 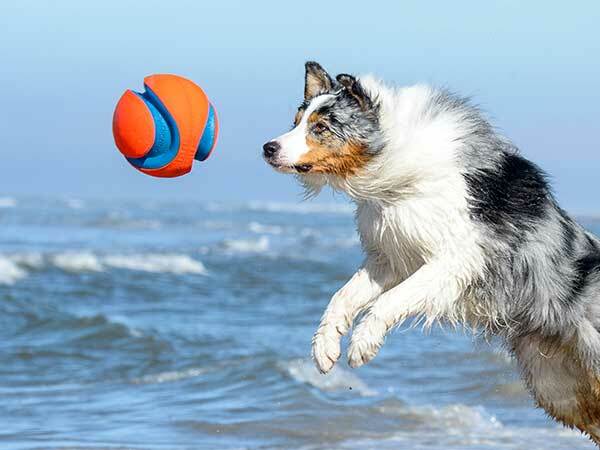 Kick Fetch Toy Ball for Dogs and is available on Amazon here. Chuckit Water Skimmer Flying Disc for Dogs available on Amazon. Chuckit! 's line includes long, cylindrical floaters (above) or round flat skimmers (left) designed to skip along the surface of the water the same way you would skip a stone. Either way, these are ideal for energetic breeds like the Australian Shepherd that love to swim and fetch. Even less active dogs will enjoy using these toys and pet owners appreciate the light weight and durability. The Ultimate In Dog Water Toys... A Pool! Slip resistant and durable. Folds up with no inflation necessary for easy set-up and storage. Available on Amazon. If playing fetch isn't your dog's thing, you can still help him enjoy the water with other dog water toys including dog pools. There are several small, lightweight and easy to set up pools on the market today designed specifically for use by dogs. The foldable dog pool by Jasonwell (right) is one of these, made to fold up when not in use and set up in seconds with no inflation necessary. Just set it up, fill it and watch your dog enjoy splashing in his own private pool! It's slip resistant and durable as it is made of extra-tough PVC with thicker slip resistant material on the bottom. A drain on the side makes it easy to empty when your dog is done. TrioGato's Easy Activated Outdoor Dog Water Fountain Toy available on Amazon. Another ingenious water toy is the outdoor dog water sprinkler by TrioGato. Made with heavy gauge steel parts for durability, this great toy is particularly good for helping your pet stay hydrated while he has fun. Just attach it to your garden hose and your dog will have an instant water source. He just needs to step on the platform with the paw and a thin stream of water will shoot up for him to drink from. No more washing and filling the water bowl repeatedly with this fun toy around! Not only are dog water toys a great way of having fun with your dog, but they can also help keep him healthy in the hot weather by providing a perfect way to cool off and stay hydrated. Help keep your pet safe and happy all summer long with toys designed specifically for water use. It's a great way to develop a bond with your best friend while you both enjoy some water fun!